This smaller-sized set of checkers features a fold-away board, high-quality plastic pieces and is great for travel, at home or anywhere. For two players, this game is ideal for children from age 5 and up to adult age. 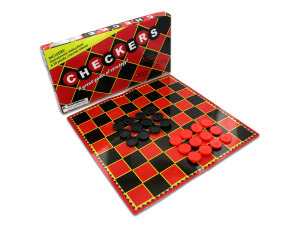 Game includes a game board, instructions and 24 plastic checker pieces. Presents a choking hazard to children under the age of 3. 24 pcs. 48 pcs. 72 pcs. — 96 pcs.